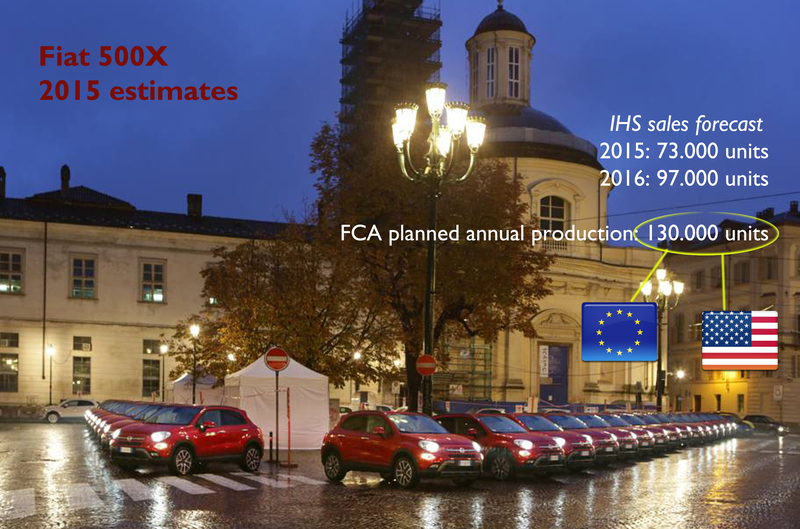 Fiat plans to produce 130.000 units of the Fiat 500X in 2015 based on the demand the car will have in Europe (sales to start in Q1) and North America (Q3). IHS believes its sales will be a bit lower. The 500X will be only produced in Melfi plant in Italy for the whole world. The new 500X has everything to be a success: style, 500 soul, technology, quality and the most important, clients. Unlike the 500L which lives in a segment that gets smaller every year, the X makes part of the fastest segment in terms of sales growth. Europeans, and soon Americans, want small SUV/Crossovers and many of them are moving from the traditional segments (B and C) to have their first SUV. Fiat wants to get a big piece of that cake with a very attractive product that shines for its look and quality (based on press reviews). But the car has to deal with a problem: it arrived years after the presentation of the Nissan Juke, Renault Captur, Peugeot 2008 and Opel Mokka, which lead the segment selling more than 10.000 units/month each. At this point Fiat must convince many of the current competitors’ drivers to change their old cars and get the new 500X, or steal B and C segments potential clients. Anyway the new Fiat 500X must become another success of the company, somehow like the small 500 has done so far. Now that the old Punto dies, the Panda gets more dependent on the Italian market, and the 500L reached its sales peak, the new small SUV must become a sales boom. It will. But the 500X isn’t the only product that must work during 2015. 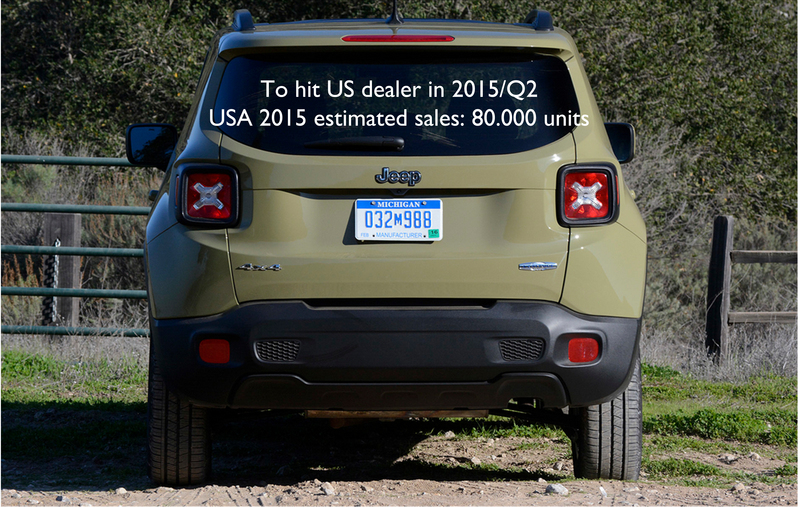 Its twin, the Jeep Renegade, has a harder task for several reasons. First of all, it isn’t the kind of car that everyone loves (like the 500 and the 500X) but its design certainly divides the opinion. Second, it is a Jeep and that means that many Europeans still don’t know about it. Third, the price positioning strategy is clearly focused on competing with the Mini Countryman, which is certainly a good thing but a tough work. The Renegade is for sure a great car whereas it could be considered the only real small SUV with the unique Jeep capabilities. But this small Jeep needs to communicate that so consumers will understand it. The success of the Renegade is in part the success of the brand in the continent. 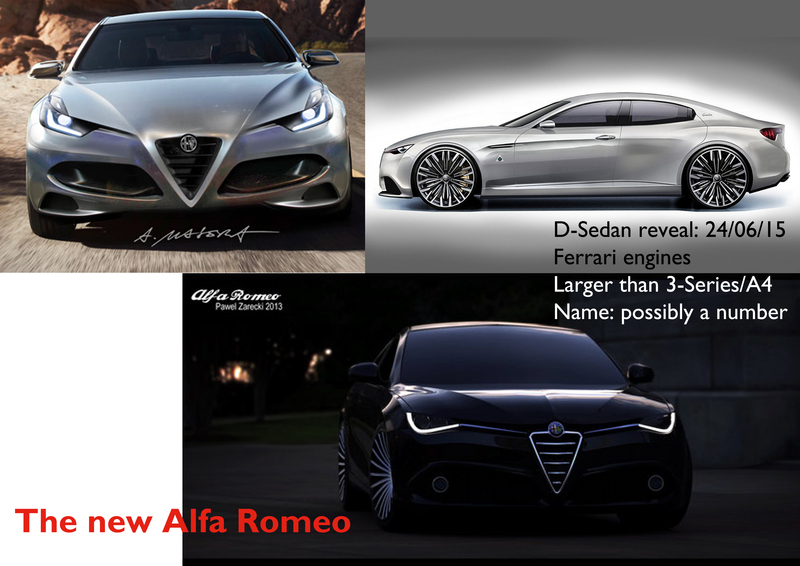 Many articles and renderings have been done referred to the new Alfa Romeo sedan. These are just some examples of how the car could look like. On June 24th 2015, during Alfa Romeo’s 105th birthday, FCA will present the new D-Segment sedan at the brand’s Arese museum, near Milan. The reopening of the museum means the rebirth of Alfa after years of disgrace. This car (that in my opinion will be a concept) will anticipate what the brand will become: a real sporty premium car manufacturer full of Italian design and performance. According to Marchionne’s plans, Alfa Romeo will be positioned one step behind Maserati in order to compete directly with Audi and BMW. He said he’s sure it can do it and even better than the Germans, due to the soul of the brand and the 5 billion euros the group will invest on it. The goal is to sell 400.000 units by 2018 with USA leading and 8 new models. The question is the timing: the new D-Sedan/SW won’t be available till the end of 2015/early 2016, which means that this year the sales volume will continue to depend on the old MiTo and the Giulietta (4C/4C Spider don’t make volume). In 2016 the brand is expected to show (probably in Geneva) the D-SUV which will be a clear competitor of the Audi Q5 and BMW X3/X4. Again, the mid-size SUV will be available months later (2016-Q3), leaving the work to the MiTo, Giulietta and the D-Sedan/SW which combined could sell around 100/120.000 units (USA market included). By that time there should be a new Giulietta (the MiTo is expected to die without a successor), which could help to reach interesting numbers in 2017 (around 180/200.000 units), when a larger SUV will join. The question is whether the brand will be able to double that result in only 1 year. Based on the recent success of Jeep and Maserati the last chance for Alfa Romeo will be for sure the right one. Part of the Renegade sales registrations in USA should come from other segments and from the Compass and Patriot potential sales. The estimation is based on FCA annual planned production at Melfi plant and the potential the car has in North American market. Americans love SUVs… big SUVs! they don’t care about gas prices, fuel-efficiency or emissions. 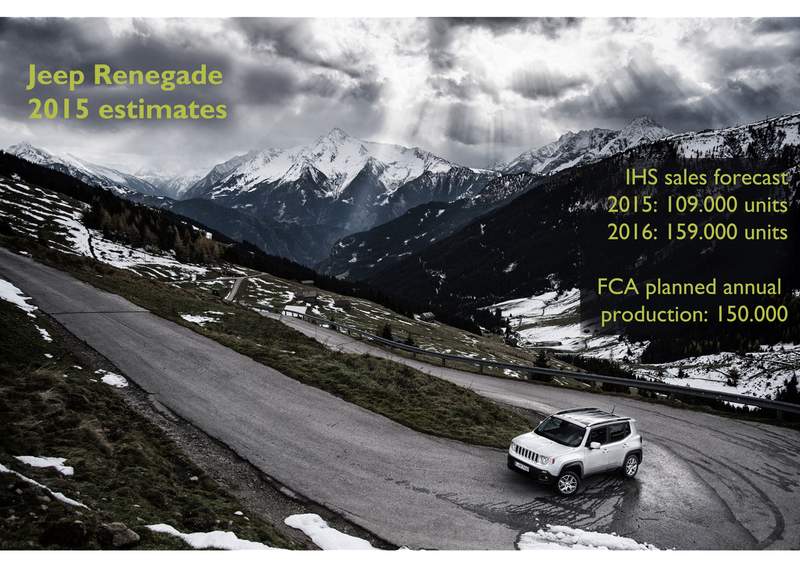 FCA will be the first big player to launch a mainstream small SUV in that market with the launch of the Italy-made Jeep Renegade by the middle of this year. The Renegade must convince the American consumers that even if it is a small car, it is a real SUV with the same capabilities of the larger members of the family. Jeep has just marked a sales record of 1,017 million units in 2014, up a massive 39% and this year it should continue to grow following the 2018 goal of 1,9 million cars. The problem is that there aren’t any all-new Jeeps to come this year (the Compass/Patriot successor won’t arrive till 2016) so the Renegade is the only product that should help Jeep to keep its sales boom, along with the good sales performance of the Cherokee and Wrangler. The luxury brand has just announced it met its goal of selling more than 30.000 units during 2014, meaning it’s heading to its 2018 objective of 75.000 cars/year. Actually sales went up around 136% with more than 36.000 cars delivered worldwide with USA counting for 40% of the total, and followed by China (26% of the total) and Europe (17%). The awesome result was possible mainly because of the Ghibli, which became the brand’s “entry-level” sedan allowing more people to afford a Maserati. This car was presented in April 2013, 6 months after the release of the Quattroporte. Since then Maserati has shown 2 concept cars (the Kubang and the Alfieri) but there’s nothing for real to come in the coming months. 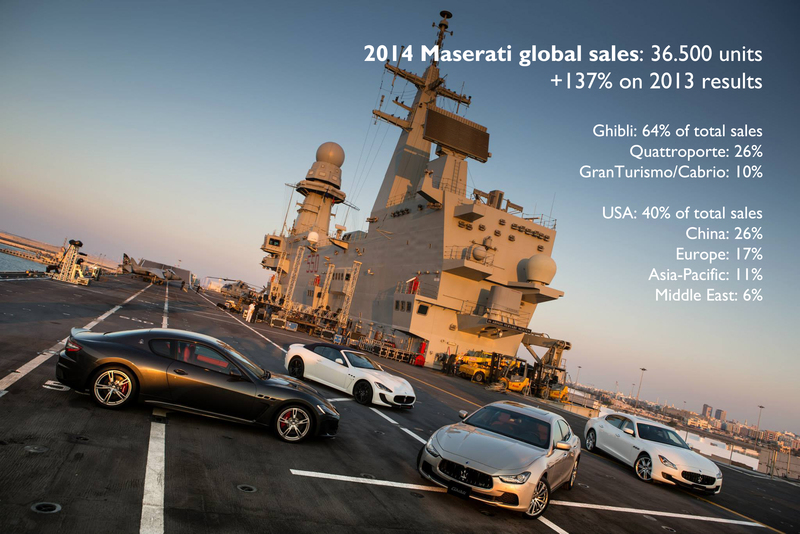 This all means that the Tridente brand must work on keeping its sales growth without the push of an all-new car. The Ghibli, Quattroporte and GranTurismo/Cabrio must do all by themselves, while FCA continues to adapt its Mirafiori plant in Turin to start the production of the Levante SUV in late 2015. Therefore the brand must prove that the recent success doesn’t correspond to a temporary boom but it is the result of a solid trend that will last for more. FCA quotes in NY and Milan stock markets. On October 13th 2014 the company debuted in Wall Street and 2 months later it offered $87 million common shares at $11 each, which resulted in a very succesful operation. They also announced its $2,5 billion of mandatory convertible debt due in 2016 and Ferrari’s spin-off. The fresh cash is supposed to help the car maker to go on with its 2018 plans but it needs more. Just Alfa Romeo’s revival plan requires 5 billion euros investment and this may be a small amount when comparing to its German rivals future investments (Audi just announced that it will spend 24 billion euros through 2019 to surpass BMW). The group has many positive things that should attract more investors: it is constantly increasing its market share in USA, Jeep and Maserati sales boom to increase profitability, Ferarri’s spin-off will bring more money, and Marchionne will stay till 2018. In 2014 Fiat completed 13 years as the absolute leader of Brazilian car market. 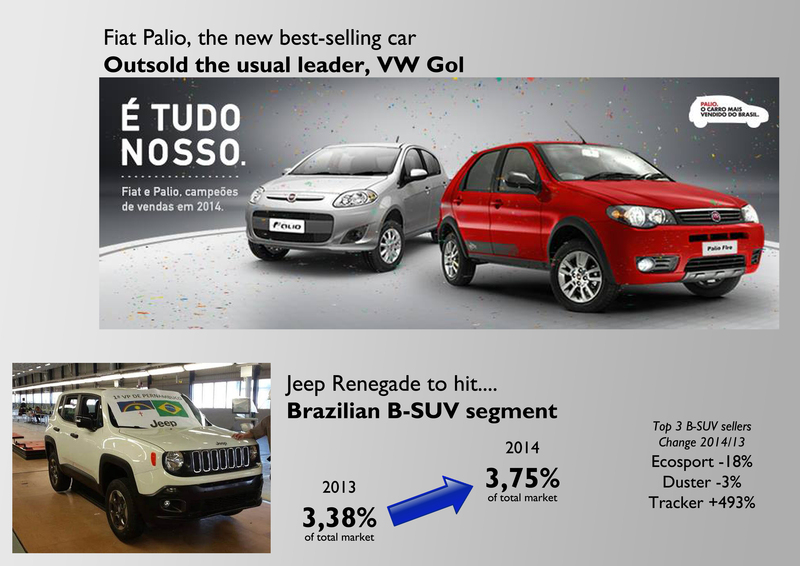 The Palio became the country’s best-selling car after 27 years of the VW Gol’s leadership. 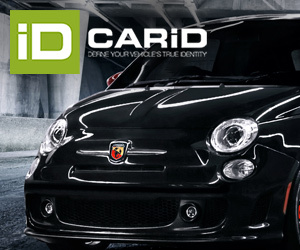 The brand sold almost 700.000 units, down 8,5% but still far ahead of Chevrolet (now in the second position) and VW. Nevertheless, the competition gets tougher due to the rise of Hyundai and some others like Renault and Toyota. Fiat needs more products and the new Jeep Renegade will become the rock-star thanks to its local production. While the new mini-car comes (a shorter version of the Uno is expected to be presented in Sao Paulo this year), the Renegade must prove that Fiat can also reign in the Brazilian SUV market. Once again the Ford Ecosport lead the B-SUV segment, which registered total sales of more than 124.673 units, which is almost the same of previous year’s figures, 124.236 units. Despite the zero growth, the B-SUV segment increased its market share from 3,38% to 3,75%. Due to the expected high prices of the Renegade, it shouldn’t steal sales to the current offer (Ford Ecosport, Renault Duster, Chevrolet Tracker) but it should increase the segment size by becoming a real threat to the C-Segment (Toyota Corolla, Honda Civic, Chevrolet Cruze and Ford Focus). It won’t be easy but for sure Brazilians will start driving SUVs finally. 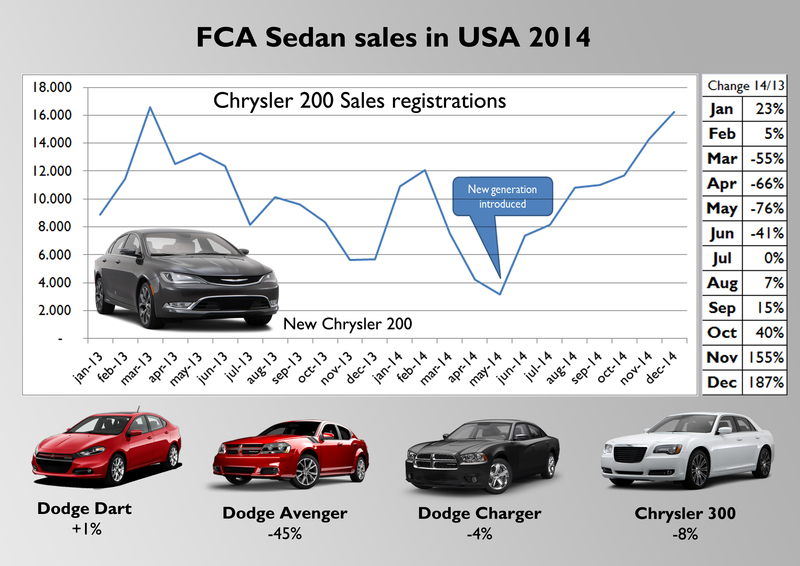 Chrysler’s recent success is mainly explained by its SUVs, trucks and MPVs sales boom. In 2014 FCA sold 16% more cars than a year earlier due to the success of the Ram pickup, the Jeep range and its large minivan offer. Together, they were able to increase their sales by a massive 28% (the 500L is included as it is a MPV). This spectacular growth (in volume means 347.396 more units) was somehow offset by the bad performance of the passenger car range (sedans, sporty cars and the tiny Fiat 500 included) which posted a negative change of 11% or 57.125 fewer cars. Albeit the group launched the Dodge Dart and the new Chrysler 200, it seems that Americans keep considering Chrysler as a merely SUV/truck/MPV maker. The Dart sales (launched in 2012) remained stable at 84.000 units just when it should had reached its peak based on its commercial life cycle. The Chrysler 200 figures (-4%) include both generations but it seems that the new one allowed to have a better final result. Actually, December 2014 sales release showed that the 200 registrations jumped a massive 187% to 16.229 units, FCA’s 4th best-selling nameplate in that market (during December the Chrysler 200 figures included the new generation’s and the Convertible’s). Based on its attributes, the good press reviews and the recent monthly sales results, the new 200 seems to be the final reason that explains that FCA USA can succeed with passenger cars as well. 9. A new partner? Can FCA continue alone? The new FCA sold around 4,7 million cars in 2014 and forecasts 5 million this year. USA, Canada and China will contribute to the growth. However it won’t be enough to battle against the giants VW, Toyota and GM, and the big Renault-Nissan, Hyundai-Kia and Ford. Sergio Marchionne has recently repeated that the group is open to any kind of cooperation with other car makers. According to him, the possible association is due to costs reasons as he believe that many of the current auto makers are wasting money and time by building their own technologies in an industry that is moving faster. One of the main challenges will be to find the right candidate to marry FCA because as Marchionne says, the company can’t continue alone and at the end (in 6 months, 1 year or 10 years) it will need to cooperate with another car maker willing to share projects and costs. The best one should come from Asia as it would help FCA to consolidate its position over there. It could be Mazda, Mitsubishi or a Chinese car maker. But it also could be PSA which has already important bases in China. This year one of FCA’s main tasks should be to consolidate its operations in China. Fiat brand posted a positive growth thanks mostly to the Ottimo hatchback, as the Viaggio sedan sales remained stable (such as it happened to the Dodge Dart in America). However, total volume is still very low compared to overall market. If FCA wants to sell 1,1 million units by 2018 it must start now and the best way is to push Jeep cars in China and Asia-Pacific. In China, the very expensive imported Jeeps were able to increase their sales by 49% to 88.000 units in 2014, counting for 8,6% of worldwide sales. Worldwide the group will for sure sell more than 5 million units this year, but the coming years’ growth will depend more on what they do in China, India and ASEAN countries. Hi Juan, nice to hear from you again, and a happy new year to you! (a) Marchionne emphasized sharing of powertrains across competitive lines as an alternative to a fresh merger/equity-swap or some such. In which case India is exemplary for FCA: it makes notable profits, mainly from sharing its engines and amt-gearbox technology with Tata as well as Maruti Suzuki, rather than from its own retail sales. Indian automotive and business media suggest that FCA and Tata are moving forward with the local manufacture and sharing of even the bigger 2 litre mj diesel for use on Tata SUV-s and on a locally-industrialized Jeep C-SUV (Compass replacement). (b) In APAC, Marchionne says, it is Jeep and later Alfa that will be the emphasis. Rightly so, especially in China, Japan, S Korea and Australia. But what of the mass market in ‘less-emerged’ automotive markets like say Vietnam, Thailand, Sri Lanka, Indonesia and India, for example? The Fiat brand is essential here, and yet the competition from the dominant Japanese and the Korean is so utterly strong that for the brand to grow it will need marketing and promotional resources that it seems FCA does not have, or is unwilling to wager on. Hence the emphasis on the high-margin, less risky Jeep and Alfa brands. A tough choice, maybe an impossible one. (c) A major strategic deal of some sort with either Mitsubishi and/or Suzuki is essential, to make up for the extreme improbability of strong growth of the Fiat brand in India and ASEAN. Especially India, since Suzuki is the dominant player with awesome margins of 10-12% in India, and where Fiat is already supplying the 1.3 diesel engines and now also the M Marelli AMT gearboxes. And where the Fiat brand faced and still does, to be blunt, an unrelieved existential crisis. India is already the 4th or 5th largest car market, and its growth prospects are surely world-best over the next decade. Personally, just to play at soothsaying: an FCA-Suzuki combination looks increasingly (from the Indian vantage point) likely, pending the VW-Suzuki dispute arbitration award. Alfa Romeo was founded in 1910. Hence, this year it will celebrate it’s 105th birthday, not its 115th.